Thank you for signing up to the Harrisonamy Newsletter. I’ll be sending you copywriting tips, tactics and resources I think you might like every now and then via email. 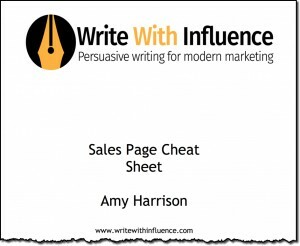 Below is your Sales Page Cheat Sheet. It’s the type of resource I include in my membership site Write With Influence, a complete copywriting training course. Write With Influence works for beginners who want to learn from scratch as well as including more advanced tutorials for professional copywriters and marketers. And with new content being added to the course, it’s a course that grows as you improve your copywriting skills.